Enjoy the full coverage of this incredible display of skill, power and strength. Split over two days, the competitors battled it out over five incredibly heavy and stressful events to see who would be the Arnold Strongman champion for 2017. The 2017 IFBB Arnold Classic and Arnold Sports Festival are Presented by Classic Productions. Celebrating the 29th Anniversary of the IFBB Arnold Classic and the 11th Arnold Amateur Championships. March 2nd – 5th, 2017, Columbus, Ohio. Held at the Greater Columbus Convention Center and the Battelle Grand Ballroom. 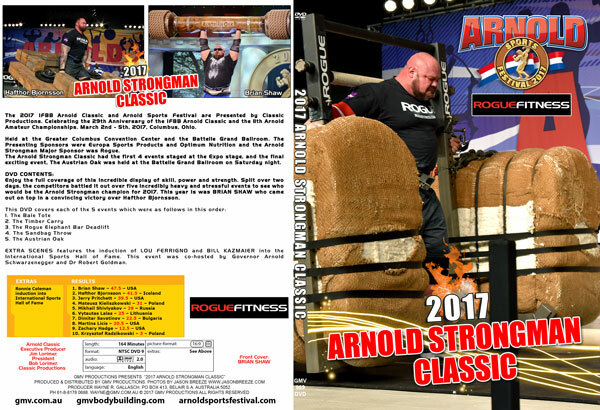 The Presenting Sponsors were Europa Sports Products and Optimum Nutrition and the Arnold Strongman Major Sponsor was Rogue. The Arnold Strongman Classic had the first 4 events staged at the Expo stage, and the final exciting event, The Austrian Oak was held at the Battelle Grand Ballroom on Saturday night. Brian Shaw won his third Arnold Strongman Classic title in dominating fashion. Enjoy the full coverage of this incredible display of skill, power and strength. Split over two days, the competitors battled it out over five incredibly heavy and stressful events to see who would be the Arnold Strongman champion for 2017. This year it was BRIAN SHAW who came out on top in a convincing victory over Hafthor Bjornsson. EXTRA SCENES features the induction of LOU FERRIGNO and BILL KAZMAIER into the International Sports Hall of Fame. This event was co-hosted by Governor Arnold Schwarzenegger and Dr Robert Goldman. 1. The Bale Tote — Two different weight yokes. Starting weight 590kg/1300lb. Athletes to carry the yoke 4 meters/13 feet. If successful, the weight of the yoke will be increased to 1565 lb. The fastest time of the heaviest yoke will win. 2. The Timber Carry — 1140 pound (517kg) frame carry up a 35 foot incline. Straps allowed. 4. The Sandbag Throw – The newest event at the Arnold Strongman Classic was the Sandbag Weight Over the 15’ Bar Throw. Hafthor took the top spot with a 95 lb. toss, which he later bested in an unofficial record-settings throw of the 100 lb. bag. 5. The Austrian Oak — Floor to overhead log press for maximum repetitions. Athletes will have a choice between the heavy Oak – 430 lb. or the Feather Oak – 385 lb. 2017 ARNOLD CLASSIC (USA) PRO RESULTS – MEN, WOMEN & STRONGMAN. 2017 ARNOLD AMATEUR (USA) MEN’S RESULTS . 2017 ARNOLD AMATEUR (USA) WOMEN’S RESULTS. THE ARNOLD CLASSIC (USA) DVD COLLECTION. Special thanks to photographers at the Arnold Classic Finals and Arnold Strongman Classic, Lou Ann Weisenstien of Slater’s Strength and Stones and Jason Breeze for these wonderful strongman photos. Not to be overlooked, our thanks to the Arnold Strongman Classic Officials: The Arnold Strongman Classic is directed by Terry Todd, Jan Todd, and Steve Slater.